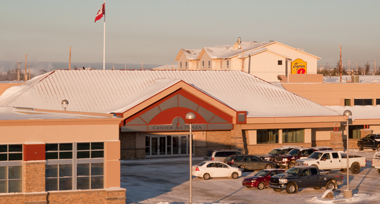 Center Ice Plaza is Yellowknife’s prime urban retail location positioned amongst the majority of the Capital city’s residents, major facilities and national retailers now enjoying highest per capita sales in the country. It is located at the intersection of Old Airport Road and Range Lake Road. Some neighboring facilities and retail services include the Territorial Regional Hospital, Twelve schools, Wal-Mart, Tim Horton’s, Canadian Tire and Grocery chains.